THE SECRET ORIGIN OF FOGHORN LEGHORN: Read Keith Scott's article on the origin of Robert McKimson's beloved rooster. Click Here! TEX AVERY ORIGINAL TITLES: Recently auctioned off on ebay was a collection of 36 original title frames from Tex Avery Warner Bros. cartoons. This lot, saved by Avery himself, contains many rare original titles lost due to Blue Ribbon reissuing. We are hoping Tim C. (aka Sogturtle) will make these beauties available to Warner Bros. for display on upcoming LOONEY TUNES GOLDEN COLLECTION dvds. 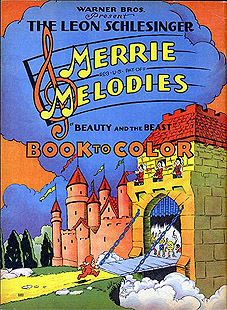 BLUE RIBBON titles: A nuisance to Looney Tunes historians and fans, these reissue titles not only removed the attractive original title art and credits, but sometimes changed the original Looney Tunes designation to a Merrie Melodies and elimiated the original on-screen production number. Warner Bros. has begun a limited restoration project, but it will take years to complete. A click here for a complete title list of Blue Ribbon Reissues (on Jon Cooke's Unofficial Looney Tunes & Merrie Melodies website). The publication of my book LOONEY TUNES AND MERRIE MELODIES: A COMPLETE ILLUSTRATED GUIDE TO THE WARNER BROS. CARTOONS in 1989 did not stop my research into the history of Warner Bros. cartoons. Since 1989, I've been fortunate to discover additional pieces of pre-1988 Warner Bros. animation not already listed in the book. Hopefully a future updated edition will contain all of my (and my colleagues) incredible later finds. None of these new findings are actual Looney Tunes and Merrie Melodies cartoons, but bits of special animation that have been previously undocumented. 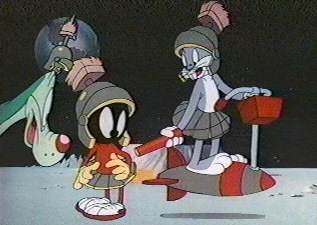 The three HOOK cartoons, a 1982 Public Service film AN OUNCE OF PREVENTION, numerous commercials produced for THE BUGS BUNNY SHOW (Heck, the entire Bugs Bunny Show itself needs further study) and commercials produced by the Warner cartoon studio in the late 1950s. Just this past month, a new piece of "Lost" animation has surfaced - Special Bugs Bunny animation produced for the trailer of LAD: A DOG (1962). As we already know, the 1962 Memorial Day Weekend release of LAD: A DOG featured, on the same bill, the Chuck Jones pilot turned half-hour featurette THE ADVENTURES OF THE ROAD RUNNER. I've had the movie pressbook for years but just recently read the fine print: There were four different Technicolor theatrical trailers for LAD: A DOG - two of them featuring special animation of Bugs Bunny! Trailer 1-A containd Bugs introducing the LAD stars. Trailer 1-C is a special ADVENTURES OF THE ROAD RUNNER trailer introduced by Bugs Bunny! There were two b/w TV spots which were shortened versions of the two theatrical trailers. I've just obtained one of the TV spots (I will researching the theatrical trailers soon), and as you can see below, they were well produced, probably by Jones' unit (The layout looks like Maurice Noble, no?). Mel Blanc provides the enthusiastic voice characterization. LOST END SEQUENCE #1: THE DUCKTATORS (1942): Most old TV prints of Norm McCabe's World War 2 classic end after a Jerry Colona jack rabbit bops himself out with a mallet. The film continues on, showing the sillouettes of the three dictators running for their lives. The Minuteman from the War Bond poster comes to life, jumps off the poster and shoots the trio dead. The Dove of peace shows his nephews his prize - their heads mounted on his wall. A plug for victory bonds ends the film. LOST END SEQUENCE #2: HAVE YOU GOT ANY CASTLES? (1938): Cut from all reissue prints is the original opening and closing featuring a town crier as caricature of writer and radio personality Alexander Wolcott (top row). Also cut is final gag (bottom row) of the cuckoo clock silenced so Rip Van Winkle can finally get some sleep. BOSKO COMIC STRIP: Here are some rare examples of Harman & Ising's 1934 Bosko syndicated newspaper panel. BOSKO LOBBY CARD: Courtesy of MATTHEW HUNTER, here is a rare lobby card featuring Bosko. I have never seen anything like this in my years of research. 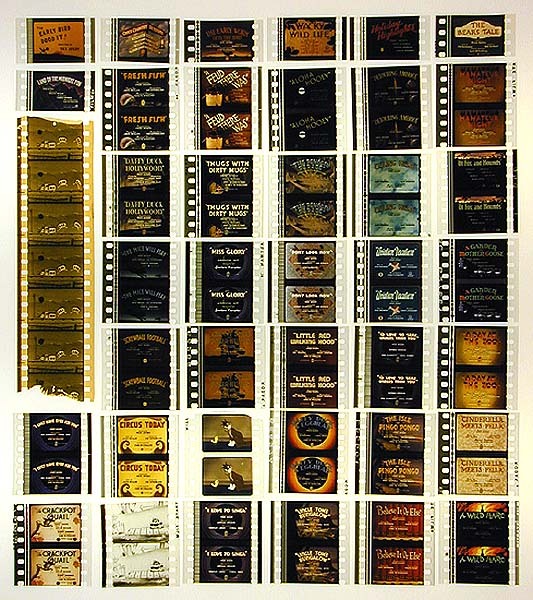 My guess is that it is from a set of 8 lobby cards for VITAPHONE SHORTS. If anyone has any concrete information about this lobby card, the set it came from, or if there were any other color 11" by 14" lobby cards for Waner Bros. cartoons, please let me know. on stage, presenting classic WB cartoons! 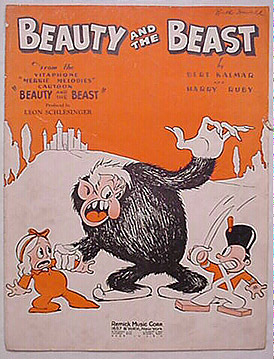 WARNER BROS. COMPILATION MOVIES: Warner Bros. cartoons were so popular in the 1940s and 1950s, that the studio released a series of cartoon compilations under various titles to play Saturday Matinees. 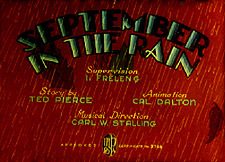 Here's the original on-screen opening title art (at right), especially prepared by the animation studio to head this compilation. 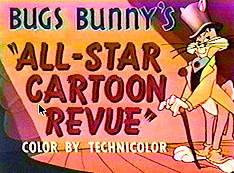 This special opening title, running about 30 seconds, begins with the standard Warner shield open (green rings), which dissolves to Bugs Bunny's head in the center. 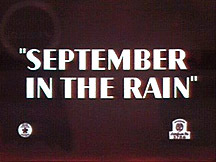 It then dissolves to this title card. This shot would fade out and the first cartoon would begin. Stalling recorded a modified fanfare for this small intro piece. 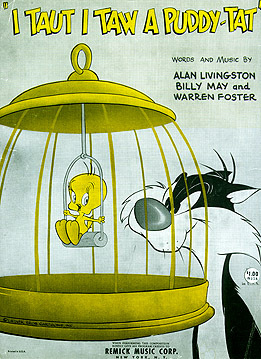 SHEET MUSIC: Here are some examples of Warner cartoon sheet music. In my 1989 book, LOONEY TUNES AND MERRIE MELODIES: A COMPLETE ILLUSTRATED GUIDE TO THE WARNER BROS. CARTOONS, I devote a small space to describe the lackluster 1965 Rudy Larriva Road Runner cartoon Chaser On The Rocks. The last sentence of the description states: "The Coyote gets shot from the cannon, sinking the sun into the west." Many readers of mine have taped this short off the Cartoon Network and written in to call me to task because the cartoon doesn't end as I describe in my book. I haven't seen Chaser On The Rocks in 15 years - and quite frankly, I had no interest in ever seeing it again. But I needed to know whether I made a mistake - or if that innocuous ending described in my book was, for some unknown reason, edited in subsequent years. So I set out to rewatch and re-research Chaser On The Rocks in an effort to clear this up, once and for all. First I got a copy of Chaser from my friends at Cartoon Network and rescreened it. Cartoon Network's video tape is six minutes and forty four seconds - that seems about right for a mid-1960s cartoon. The ending of the cartoon was indeed diferent that what I wrote in my book. The Coyote, caught in inside a cannon, gets blasted into a highway guard rail and is violently ricoheted back into the cannon - only to get shot out again and again by the Road Runner. Fade out. I noticed that the Cartoon Network tape had a slate at the head stating this transfer was created in 1999 - is it possible there was an edit done in the 90s? Perhaps I'd seen an uncut version in 1988? Next, I went into the dark recesses of the Cartoon Research vault and found my original 1981 Scarecrow Press book The Warner Brothers Cartoons and looked up the one sentence review which concludes: "(The Coyote) ...in the end, crashes into the sun and sinks it." I then dug out my handwritten notes and manuscript for my 1989 re-write (amazingly I still had them!). For that book, Will Friedwald and I personally watched (or re-watched) every cartoon to ensure accuracy of the descriptions. My original handwritten notes (see below) conclude with the sentence, "Detours RR into pipe looking into cannon but gets caught in his own trap." No mention of sinking the sun into the west. Hmmm. Hot weather gags: crazy from the heat, the Coyote imagines Road Runner mirages. 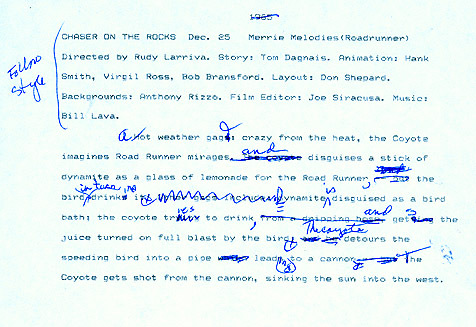 The Coyote disguises a stick of dynamite as a glass of lemonade for the Road Runner -- but the bird drinks it. 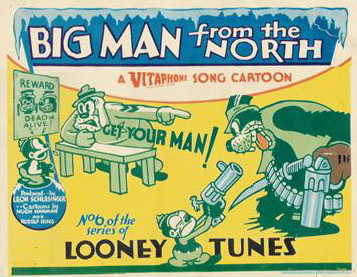 Other gags include dynamite disguised as a bird bath; the coyote trying to drink from a dripping hose getting the juice turned on full blast by the bird; and he detours the speeding bird into a pipe which leads to a cannon -- but the Coyote gets shot from the cannon, sinking the sun into the west. I wonder why I wrote that the Coyote sinks the sun. I next procured an original 35mm theatrical print of CHASER ON THE ROCKS and re-screened it. The ending is the same as the Cartoon Network version. Thus, I must now admit it - my book is wrong. I made a mistake - but how? From where did this error originate? There was only one answer. When Will Friedwald and I compiled our original Warner cartoon filmography (THE WARNER BROTHERS CARTOONS, Scarecrow Press, 1981) we cheated a few cartoons we had no access to at that time. 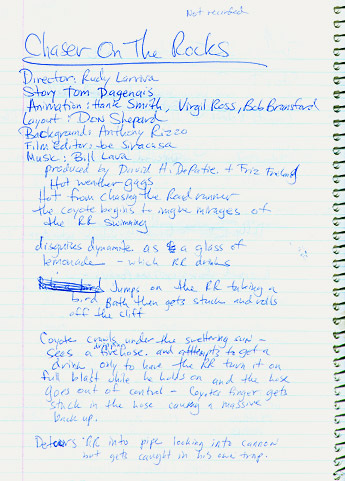 Because we had no access to CHASER ON THE ROCKS, I relied on the official Warner Bros. plot synopsis sheets created at the time (these were done for exhibitors and in-house office reference). 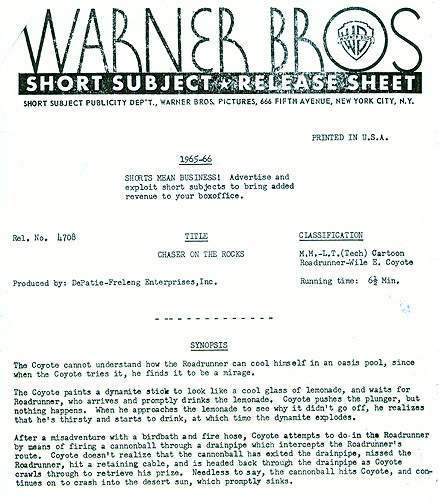 Reprinted below is the "official" Warner Bros. plot synopsis for CHASER ON THE ROCKS. Read the last sentence, you'll note that this is where the mistake occured. I somehow carried it over to the 1989 book. God, I hate that cartoon. And I admit this is awfully shoddy research - but these mid-60s Rudy Larriva cartoons make my skin crawl. To clear up this error, I've been forced to track down the film and watch it again and again. I've more than paid for my crime. LITTLE GO BEEP (11/6/2000) I saw LITTLE GO BEEP at the L.A. World Animation Celebration competition in June 2000. LITTLE GO BEEP is a brand new "Looney Tune" cartoon and it's a high class theatrical short subject, directed by Spike Brandt, written by Earl Kress, and produced by Kathleen Helppie and her Warner Bros. Classic Animation crew. Not unlike the classic "OLD GREY HARE", this cartoon concerns the very first meeting, and chase, of Wile E. Coyote and the Road Runner, when they were babies. The film begins with dad, Cage E. Coyote (voiced by Stan Freberg), lecturing his son, Wile E., on his mission in life to catch a Road Runner. Whenever Wile E. attempts to say something, Father tells him to hold his tongue, to say "not one word until you catch a Road Runner!" (A-ha, so that explains his eternal silence!). Wile E. goes out and finds a Road Runner (with training wheels) to chase - The classic Latin subtitles appear and the chase is on. The Coyote orders various stuff from Acme, including a Badger Trap, a Jack-in-the-box, some water rockets and a "Stretch Hamstring" action figure, all of which fail, violently, to catch the baby bird. All the props also come together in the end to restrain the coyote. Papa Cage E., observing this initial failed chase, turns toward the audience to comment, "He's a good boy, but I don't think he'll be talking for a long time!" The "That's All Folks!" end titles are cleverly hand-written in baby's handwriting and a "Baby Looney Tunes" logo appears on the lower part of the bullseye title card. The production is handsome, the music is faithful to Milt Franklyn, and the animation would make Chuck Jones proud. The gags are funny (the audience laughed in several spots) and it's a great addition to the Looney Tunes library. According to the festival program book, the running time is 7 minutes, 54 seconds! The film was released in one Los Angeles theatre in November 2000 to qualify for Academy Award consideration.  Discuss COAL BLACK here!  Jack Tatay's LOONEY TUNES Discography! from the LOONEY TUNES GOLDEN COLLECTION DVD. Your previous VHS copy on left - restored images (from current DVDs) at right. MORE COOLNESS TO COME. PLEASE CHECK BACK AGAIN. Special thanks to Mark Kausler and Charles Brubaker for certain frame grabs.